PIKETTY- CAPITAL IN THE TWENTY-FIRST CENTURY- THE NEWS IS NOT GOOD! It is somewhat astonishing that Thomas Piketty’s CAPITAL in the 21st Century remains at the very top of the New York Times Best Seller List! Not intending to be condescending, this is not an easy read even for the most ardent observers of the national and world economy. The first 250 pages, filled with exhaustive research over a 250 year period, complete with charts and graphs, is a test of anyone’s concentration. You may need to read many pages more than once! The good news is that once through this sophisticated and advanced course in economics, the reader will come to an understanding of the inexorable march of an economic matrix that appears to be leading to a dysfunctional environment for the capitalistic system as we have known in America for over 300 years. Ironically, there is currently a billboard on the south bound FDR Drive in New York City that reads,” The French Aristocracy Didn’t See It Coming Either! ” Piketty does not set out to be an alarmist but rather to lay out what he believes is the most definitive research ever completed on the subject of inequality and the distribution of wealth in America and Europe, dating back to the seventeenth century. Admittedly, Piketty qualifies some of the early collection of data as anecdotal but at the same time has sought out all-available recorded records to track the distribution of wealth over three centuries. What is most troubling in the Piketty thesis is his substantiation of a mathematical paradigm that left unchecked , places the concentration of wealth worldwide and particularly in the United States on an unstoppable course of disastrous inequality. Not an exciting prospect. Piketty: ” If the growing concentration of income from labor that has been observed in the United States over the last few decades were to continue, the bottom 50% could earn just half as much in total compensation as the top 10% by 2030.” In the United States, the most recent survey by the Federal Reserve, indicates that the top decile own 72 percent of America’s wealth, of which the bottom half claim just 2% . These figures clearly delineate the plight of the dwindling middle class. If the top ten percent and the bottom 2 percent control 74 percent of all wealth in America, that leaves only 26% for everyone else! 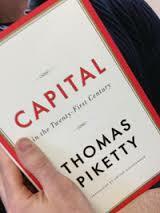 Fundamental to Piketty’s thesis is that a predicted economic annual growth rate in America of 1.5 percent or less will force a greater concentration of wealth among the top decile because based upon a rate of return there will be no incentive to invest risk capital back into the economy. The top ten percent can comfortably continue to invest capital at 4-5% ( with some hedge funds at 10-30%) and in essence keep these capital resources off the table in the hands of the super wealthy, further shrinking the middle class and decimating the lower class. He also predicts that as future generations of the wealthy mature, inherited wealth will be exclusively bequeathed, removing it from the general capitalistic economy, in the same manner as did the old European aristocracies. Thus, a new American Aristocracy fueled by inherited wealth? Piketty: ” In my view, there is absolutely no doubt that the increase of inequality in the United States prior to 2007 contributed to the nation’s financial instability. The reason is simple: One consequence of increasing inequality was virtual stagnation of the purchasing power of the lower and middle classes in the United States , which inevitably made it more likely that modest households would take on debt, especially since unscrupulous banks and financial intermediaries, freed from regulation and eager to earn good yields on the enormous savings injected into the system by the well-to-do, offered credit on increasingly generous terms.” ” If we consider the total growth of the U.S. economy in the thirty years prior to the crisis, we find that the richest appropriated three-quarters of the growth.The richest 1-percent absorbed 60 percent of the total increase of U.S. national income in this period. It is hard to imagine an economy and society that can continue functioning indefinitely with such extreme divergence between social groups.” Capital In The Twenty First Century has raised considerably debate and the outright questioning of Piketty’s research and formulas ( r>g ). However, if you take him for his word, the forecast is not comforting and for sure, don’t look for many rave reviews from the financial establishment! Unfortunately, if you have sensed something wrong with the economy, Piketty offers great insight but little comfort! Capital in The 21st Century is well worth a major investment of time. This entry was posted in Non-Fiction and tagged Books on Financial Crisis, Capital in the Twenty-First Century, French Revolution, income inequality, Thomas Piketty. Bookmark the permalink.